"Out with Temer – direct elections now!". Amid meltdown in Brazil, the left calls for democracy, while the right must find ways to deny the people a voice. 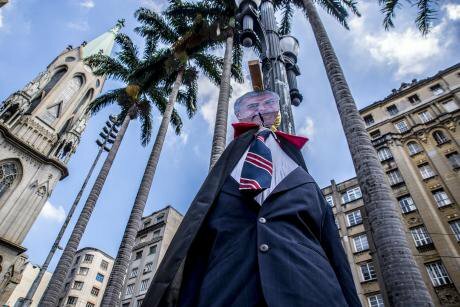 A puppet of Brazilian President Michel Temeris hanged up by a group of protesters in Sao Paulo, Brazil on April 15, 2017. NurPhoto/PA Images. All rights reserved.The Brazilian Workers’ Party (Partido dos Trabalhadores, PT) won the country’s presidential elections four times in a row; first with Luís Inácio Lula da Silva (2003-06, 2007-10), then with his hand-picked successor, Dilma Rousseff (2011-14, 2015-16). During its 13 years in office, the PT changed Brazil in many ways; four are principally worth mentioning, as they would come to play key roles in the elite conspiracy to impeach Dilma Rousseff and destroy her party. First, the PT democratised the state. It implemented the social and civic rights included in the 1988 ‘Citizen’s Constitution’, and advanced Brazil’s emerging welfare state across several fields of social provision. Second, the PT changed the social composition of the state through the appointment of thousands of leaders of mass organisations to positions of power. For the first time in Brazilian history, millions of poor citizens could recognise themselves in the bureaucracy and relate to close friends and comrades who had become ‘important’ in Brasília. For the first time in Brazilian history, millions of poor citizens could recognise themselves in the bureaucracy. Third, PT policies contributed to a significant improvement in the distribution of income, through the creation of millions of unskilled jobs, a rising minimum wage, and higher transfers and benefits. Fourth, although the government never abandoned the neoliberal macroeconomic policy framework imposed in the 1990s, it gradually introduced, in parallel, neodevelopmental (that is, expansionary Keynesian) policies that helped to secure faster growth, higher profits and wages, and distributional gains. Yet the PT failed to reform media ownership, which secured the space for a virulent opposition aligned with the country’s neoliberal elites. The party also endorsed a model of distribution based on financialisation, consumption, low-paid jobs, and transfers: essentially, both the rich and the poorest gained, while millions of skilled jobs were lost through the ‘globalisation’ of production, privatisations, the simplification of managerial structures and new information technologies. They sliced not only the number of ‘good jobs’ in manufacturing, but also middle management posts, and increased precarity even for relatively senior jobs. The Workers’ Party elicited mounting opposition by the neoliberal elite and the upper middle class both because of what it did do, and because of what it failed to do. PT economic policies irked finance and most of the bourgeoisie; they suffered losses because of greater state intervention, the reduction of interest rates and the economic downturn since 2011; they also resented the perceived loss of their control over state policy under Rousseff. Rousseff repelled most professional politicians because of her unwillingness to conform to the established principles of pork-barrel politics. The upper middle classes were alienated from the PT because of their ideological commitment to neoliberalism, and because the party supported the economic and social ascent of the working class. The upper middle classes were also tormented by losses in their income and their dislocation from the outer circle of state power. Rousseff repelled most professional politicians because of her unwillingness to conform to the established principles of pork-barrel politics. The government lost the support of large segments of informal workers, notably the flocks of Pentecostal churches that opposed the expansion of civic rights and progressive values, with flashpoints around Dilma’s opening towards the liberalisation of abortion and citizenship rights for homosexuals. Finally, the expansion of the courts, the Attorney General’s Office and the federal police – in terms of size, resources and powers – enabled them to launch a devastating attack on the PT. These elite groups converged around an aggressive ‘alliance of privilege’ that was cemented ideologically by the mainstream media. The weakness of the political parties of the right enabled the media to take up the mantle of the opposition, hunting down the PT systematically, drawing upon a discourse which incorporated right-wing values, neoliberal economics, and strident allegations of corruption. The revolt of the elite was triggered by Dilma Rousseff’s re-election in 2014. Her victory came as a surprise to the alliance of privilege, who underestimated the capacity of the PT and the left to mobilise a progressive coalition drawing upon the working class and the poor. However, Rousseff’s triumph was fragile, and coincided with the continuing deterioration of the economy, which has plunged the Brazilian economy into the worst crisis in its recorded history. The distributional improvements that had legitimised the PT administrations stagnated. Repeated policy failures, the media onslaught, and the disorganisation of the government’s base within the most right-wing congress in decades, combined to create a generalised dissatisfaction that focused on the state. Since 2005, the mainstream media and the judiciary launched successive waves of attack against the PT, with corruption emerging as the ideal tool to fell the Rousseff administration. The lava jato (carwash) operation, pioneered by the federal police since 2014, revealed that a cartel of engineering and construction companies had bribed a group of politically-appointed directors of the state-owned oil conglomerate Petrobras, in order to secure a virtual monopoly over oil and other contracts. Those bribes allegedly channelled funds to several political parties, among them the PT. The federal police and public prosecutors made overt political use of these investigations. They disregarded evidence that right-wing parties were involved in similar cases, selectively leaked compromising information to the media, and sought to implicate the PT wherever this was possible. Prominent politicians and the managers of several large firms were routinely arrested in order to extract plea bargains. Those refusing to co-operate were imprisoned indefinitely. When they finally surrendered, the aspersions cast on the PT were blatantly used to fuel the scandal mill. Accusations against the other parties were normally ignored. The unfolding scandal catalysed the emergence of a mass right-wing movement, whose grievances included a laundry list of deeply felt but unfocused dissatisfactions. The unfolding scandal catalysed the emergence of a mass right-wing movement populated by the upper middle classes, whose grievances included a laundry list of deeply felt but unfocused dissatisfactions articulated as demands for the ‘end of corruption’ and Dilma’s impeachment. Their excitement was misguided, for three reasons. First, the anti-corruption discourse of the alliance of privilege was selective. It targeted the institutions and parties aligned with neodevelopmentalism, suggesting that their most important goal was to change government policy, rather than eliminate corruption. Second, chatter about corruption provided a convenient figleaf, obscuring meaningful debate on economic policy. For example, the neoliberal bourgeoisie would find it difficult to campaign to curtail labour rights, cut pensions, weaken domestic industry and cripple Petrobras. However, if these goals were disguised as a ‘struggle against corruption’, policy changes could be smuggled in later, regardless of the interests of the vast majority. Third, the coordinated attack by the judiciary and the media disconnected the PT from its sources of funding and its mass support. The loss of millions of jobs and billions of dollars in output and investment were merely collateral damage. Lava jato was remarkable for another reason, unrelated to corruption: it was indicative of a severe distortion of Brazil’s constitution, by which guarantees of the independence of the judiciary supported the emergence of a self-appointed group of ‘pure’ investigators, in fact aligned with the political right, who called upon themselves to clean up the political system. Their mission was fortuitously supported by elites’ mounting animosity towards the PT, the sensitivities of the middle classes, the deepening economic crisis, and the paralysis of the Rousseff administration. In the mêlée, the economic crisis, rising unemployment, gargantuan corruption and a torrent of scandals became thoroughly enmeshed. The mainstream media began trumpeting a message that the PT was at the centre of a web of thievery without precedent: Lula and Dilma were robbing the republic by day and at night, they conspired to turn Brazil into a satellite of Venezuela. Rousseff lost a voter on her impeachment in the Chamber of Deputies by 367-137, on 17 April 2016, and by 61-20 in the Senate, on 31 August. Dilma Rousseff’s impeachment was a grotesque spectacle. Her trial was overtly political, all legal niceties having been abandoned long ago, and it was transparently orchestrated by a cabal of thieving politicians. They claimed the right to impose an unconstitutional vote of no confidence on a President who had made mistakes, but committed no crime. The impeachment process was driven by an unholy coalition between the leadership of the opposition, bitterly regretting their four consecutive defeats in Presidential elections, leading figures in the judiciary, Rousseff’s traitorous Vice-President, Michel Temer, and the Machiavellian speaker of the Chamber of Deputies, Eduardo Cunha, who was struggling with heavy corruption charges in Brazil and in Switzerland (he would end up in prison soon afterwards, his usefulness to the coup overwhelmed by the heavy political cost of the allegations being made against him). They were trailed by a motley crew of minor characters, many of whom were accused of egregious crimes – not least corruption – and by a parade of business leaders whom the media fêted as if they were the nation’s saviours. In the following months, the administration led by Michel Temer engaged in a fully-fledged attempt to restore orthodox neoliberalism, undermine employment rights and internationalise the economy. The government’s attack was impeded only by its own venality, incompetence and endless tribulations, as Temer stumbled against the law, emerging mass resistance and the ongoing threat that his parliamentary base of support would disintegrate. Temer stumbled. This was expected. What came as a surprise was the recent split in the alliance of privilege. This was expected. What came as a surprise was the recent split in the alliance of privilege. The main interest of capital as a whole was the restoration of orthodox neoliberalism, relying on the judiciary to continue dismantling the PT. But by now the judicial attack had already gained its own momentum, and it has been strongly backed by the upper middle classes, which treat the judges and public prosecutors as major celebrities. In the country of football megastars, soap operas and Carmen Miranda, this is important. And indeed the media has harnessed huge revenues from popular interest in the investigations. On 18 May, the owners of JBS, the world’s largest meat processing conglomerate, agreed a plea bargain. They revealed JBS funding to 28 parties and almost 2,000 politicians, and produced evidence of large cash payments to the leader of the right wing PSDB (Brazilian Social Democracy Party) and runner-up in the 2014 presidential elections, Aécio Neves, against whom multiple accusations had already emerged but were never investigated seriously. Finally, JBS produced the recording of a conversation between one of its owners and President Temer, suggesting that JBS would pay Eduardo Cunha for his continuing silence while in jail, in order to avoid incriminating his old friend Temer. The reaction in Brazil was explosive. Temer, already tainted by multiple allegations of corruption and other misdemeanours, and facing difficulties pushing his neoliberal agenda in congress, was abandoned by parts of the mainstream media, who spotted a lame duck and called for his resignation or, failing that, impeachment. His political allies are jumping ship. Temer is probably doomed. The problem for the remnants of the alliance of privilege is what to do next: the constitution suggests that congress should elect an interim president to steer the ship until the 2018 elections. The left is calling for direct elections now. Elections are unacceptable for the alliance of privilege, because the political right is divided and has no readily viable candidate. Despite the political chaos, the Brazilian left finds itself in a good position for the first time in several years. The genie has not only escaped from its bottle; it has gone berserk. In contrast, the left could field Lula, who is leading in the polls in spite of the attacks he has been enduring for several years, and despite the fact he is facing investigations that are certain to find him guilty of something: in a few months, he is likely to be unable to run for public office. Despite the political chaos, the Brazilian left finds itself in a good position for the first time in several years. The genie has not only escaped from its bottle; it has gone berserk. Temer is damaged goods rather than a statesman; it has become incontrovertible that Dilma Rousseff was overthrown by a criminal gang; the alliance of privilege is split, and the left is calling for elections while the right must find ways to deny the people a voice. The left can win this battle, and upend the conspiracy of the elites. Now is the time to fight, on the streets, in the offices, factories, and neighbourhoods: Fora Temer – eleições diretas já!